My name is Amy and I am a fully qualified Mobile Holistic Massage Therapist. I am based in Weston Super Mare so I am able to travel out to most parts of North Somerset, Bristol and South Gloucestershire. With so many of us leading busy lives these days, I wanted to be able to provide an easy, stress-free option that enables you to have treatment in the comfort of your own home. Over the years I have managed to treat many clients succesfully with a variety of different ailments. With a wealth of hands on experience and extensive knowledge in Anatomy and Physiology from years of training and working in the field I am able to tailor my treatments to suit your needs. By using free flow remedial deep tissue massage techniques I can ensure that the areas of your body that require the most attention receive them in order to relieve your aches and pains. (just book a free flow deep tissue massage) But if you just want to relax after going through a stressful period I can a sequentialise the massage routine in a repetitive manner that will reduce the levels of cortisone being produced by your adrenal glands thus inducing a heightened state of relaxation. Or I can combine both Swedish Massage and Deep Tissue techniques such as Trigger Point Therapy and Neuromuscular Massage which I call a Therapeutic Massage that will help to rebalance your body and its internal systems whilst getting rid of any knots and release trapped nerves that have been causing you pain and discomfort. As well as treating clients on a one to one basis I can also cater for group bookings. I can cater for pamper parties, ladies nights, festivals and corporate on site massage. 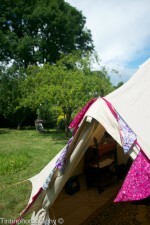 I have a beautiful sandstone 4x4m Bell Tent that comes equipped with heating, towels, blankets, bed, music and essential oils to pamper your guests come rain or shine. Which can be set up in your garden or field that you have hired for an event which you are hosting. I am available from 10-4pm Monday, Tuesday, Thursday, Friday and Saturday.